In the early days of retirement there is great joy in not having anything to do when you wake up in the morning. It’s such a relief to roll over in bed, especially on those cold dreary days when you realize you can go back to sleep or do anything you want or nothing at all. You experience blissful nothingness. Some newly minted retirees like it and continue to dance through retirement without a care in the world. Others get bored and begin to look around for something more meaningful to do. I remember the first time I retired I thought I would be perfectly content to play golf every day. I could hone my game and lower my handicap. Plus a typical golf club has a very appealing environment. It all seemed like a great place to hang out. I fell into the daily golf routine. Then a strange thing happened. I was driving home one day when I suddenly felt a gnawing emptiness inside. It hit me pretty strongly that I was slowly but surely falling into a rut. Sure, I liked to play golf but I felt I wasn’t accomplishing anything. It was the same-old, same-old every day. I was pretending to be happy because that’s what you’re supposed to feel like in retirement. I shared my feelings with my wife. She listened intently and said, “Maybe you should go back to work.” I said no, no. I’m retired. I’ll get over it. I just need to readjust my attitude. A couple weeks later I still wasn’t feeling any better. It became apparent that I had to find something to do that provided my inner being with a sense of satisfaction and accomplishment. I continued to resist and replied that I was retired. I liked to tell people I was retired—it conveyed a sense of a well-being and achievement. But the question my wife posed was a good one and caused me to think about what I really liked to do. The fastest way to create that sense of accomplishment and personal well-being was to go back to work. I decided to approach some of my longtime former clients and offer my services. Soon I was back to work enjoying the sense of satisfaction that comes from solving problems. I don’t suggest that this approach is the answer for everyone who experiences a similar condition. It was a personal decision process that worked for me. Once I was back to work, I was able to bring about a better balance in my life between work, family, leisure and the spiritual side. I had no sooner settled into my new routine when the Lord put his hand on my shoulder and sent me in another unexpected direction. That’s when I went to work for the Archdiocese of Atlanta. The experience taught me that God is truly in charge of our destiny. We may think we’re in charge but the hand of the Almighty is directing our every move. All we ever know for sure about our life is where we start. God determines where we end up. My wife, a registered nurse by training, experienced a similar desire to have a greater sense of accomplishment in her retirement years. Her answer was to work part-time for a nonprofit that conducts vision screening in pre-K schools to identify undetected vision problems. She loves the challenge and receives a wealth of satisfaction from grateful parents who never knew their child had a vision problem. My experience with the archdiocese doesn’t mean that everyone who is feeling a little frustrated by the lack of accomplishment in retirement should go to work for the church. However, I can assure you that every parish in our diocese has a great need for volunteers in religious education and the many operational and administrative functions that require experienced talent. Keep in mind that we seniors are the only segment in our parish population that has the time, talent and treasure to address the many challenges facing our church. We have the time because most seniors are retired. We have the talent because of our real world experience and wisdom. And seniors collectively control about 80 percent of the financial resources in the U.S. That doesn’t mean all seniors are rich. 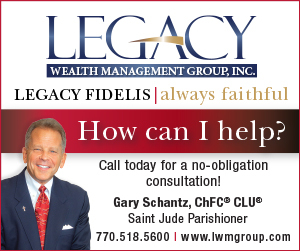 It merely suggests that seniors are usually the financial backbone of many parishes. We seniors are a truly valuable asset. There isn’t any challenge in our parishes that could not be handled within the experience and wisdom base of the parish seniors. If you’re looking for something meaningful to do, talk to your pastor first. He has a great need for you. Let me know if I can help.